Registration for the Marathon is limited and may close before the published registration deadline without notice. The race committee recommends signing up well in advance if you are training and planning to participate. There is an 7-hour course limit. This means that you must be able to maintain an average pace of 16-minutes per mile. Please note: There is no Early Start. All Marathon participants start at 8:00AM. Bib numbers should be worn visibly on your FRONT. Please keep your personal information (submitted at the time of registration) up to date! If you change from a Greenhorn to an Experienced Marathoner, be sure to let us know. You can update your personal information by following the directions found on our FAQ page. All parking options in downtown Bar Harbor are an easy walk to the starting line, located at 200 Main Street. Posted parking hours in Bar Harbor are not enforced after Columbus Day. The baggage check vehicle will be stationed at the Village Green in Bar Harbor, very near the start. You must check your bag 30-minutes prior to the race start. No bags will be accepted after 7:30AM. Bags will be transported to the Finish Line in Southwest Harbor. Note: There is no formal awards ceremony. Age-Group and MDI Area winners may claim their awards as divisions are filled. It is the competitor’s responsibility to check posted results and claim their award near the finishing area before they leave. Awards will not be mailed. The Marathon route has been certified at 26 miles 385 yards (42.195km) by USATF. (Certification #ME12018JK) The certification sanctions the Mount Desert Island Marathon as a direct qualifier for the Boston Marathon. As part of our USATF course certification, this marathon distance has been measured and certified on the LEFT side of the road, FACING oncoming traffic. Do not run far out in the traffic lane, or cross the center line, over to the right side of the road or you will not be running the entire 26-mile, 385-yard distance, and you will risk being disqualified.It is very important to note that parts of the course will remain OPEN to local & volunteer automobile traffic. Leah Frost, Leah Thorvilson, and Leah Jabbour are three different, individual women. 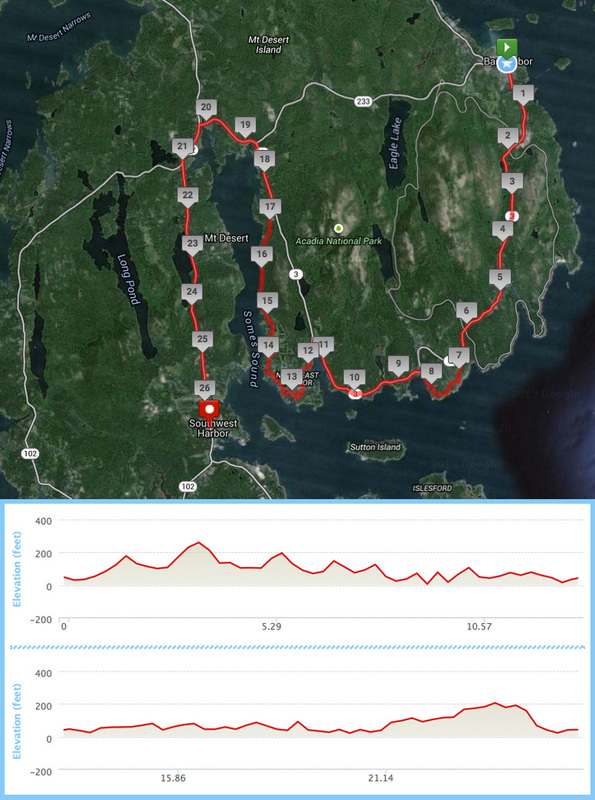 Down East Magazine named the Mount Desert Island Marathon “Maine's Prettiest, Leah-est Marathon” in their Acadia Centennial special!